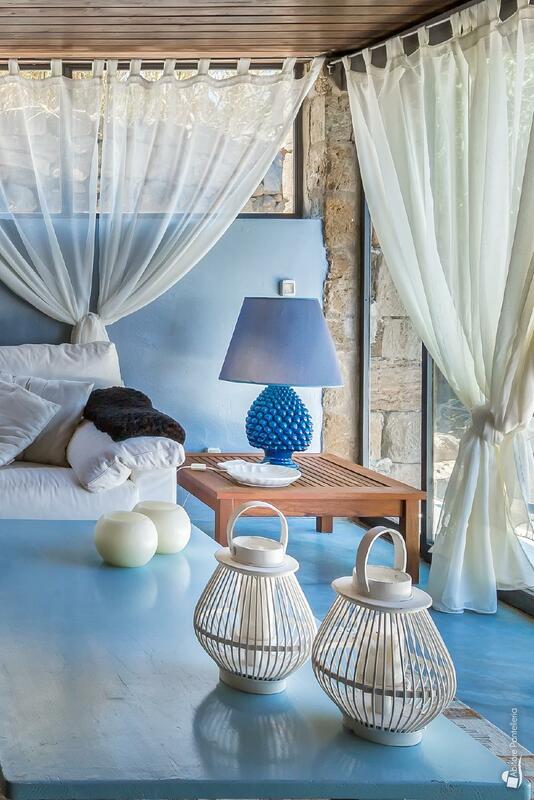 The beauty of the place lies in the light that infuses it, in the colours that characterise it and in the atmosphere that can offer to those who stay here. 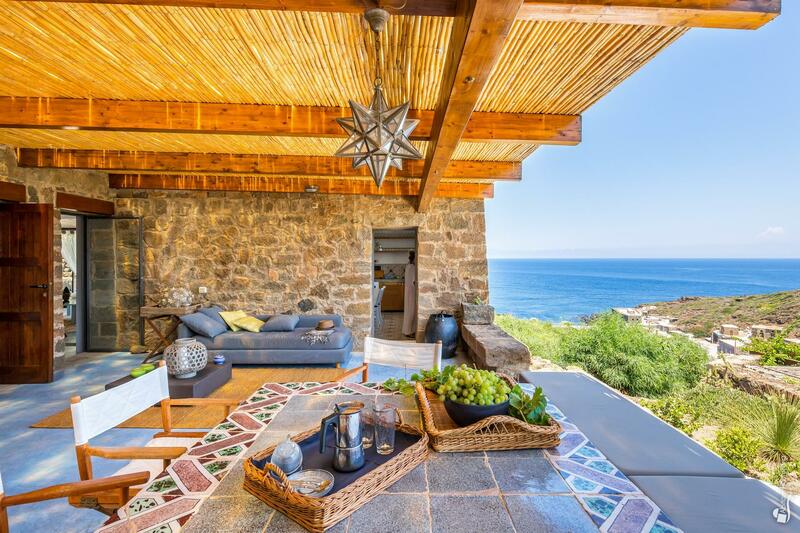 An alchemy composed by many elements, a union that becomes a part of a unique experience, that is having a holiday in Pantelleria and staying at the dammuso Le Stelle di Levante (Eastern stars): a wide and well-finished property with a breath-taking view of the sea, located just beside one of the most known location of the island, between Cala Levante, Cala Tramontana and Arco dell’Elefante (Elephant Arch). 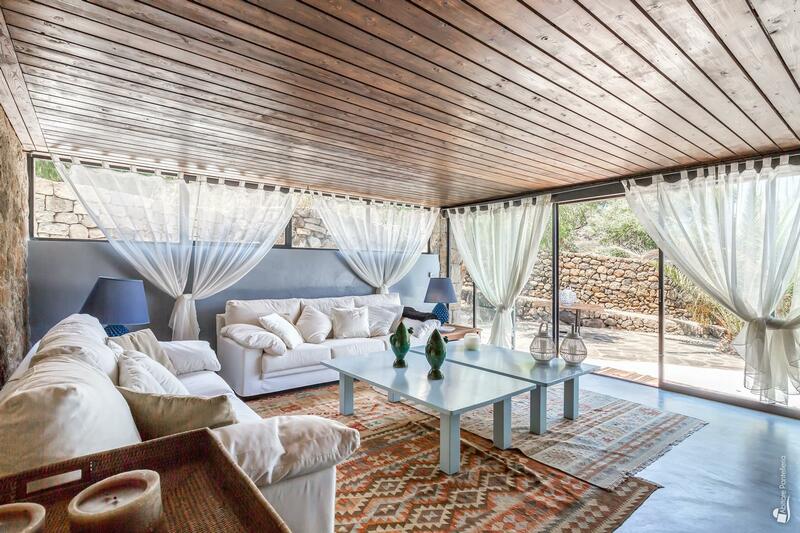 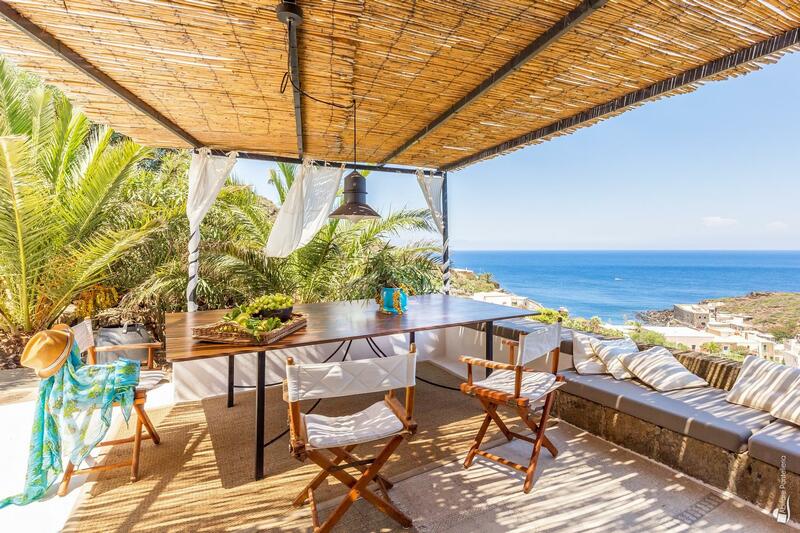 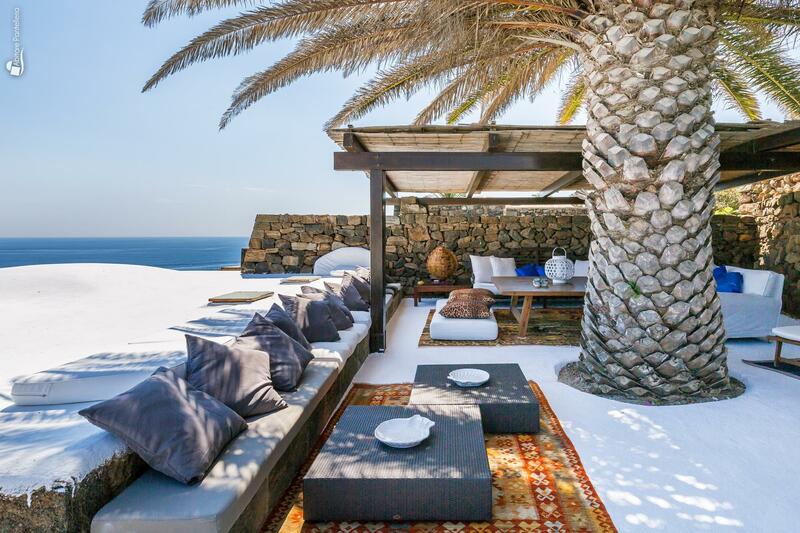 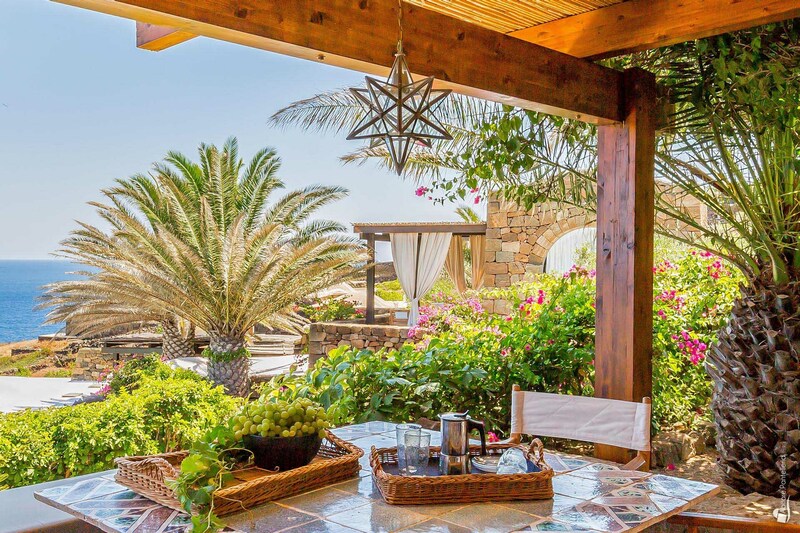 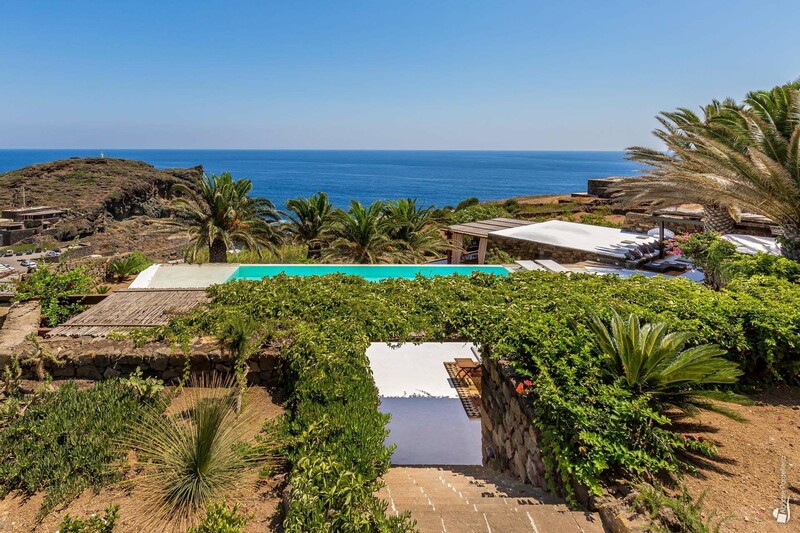 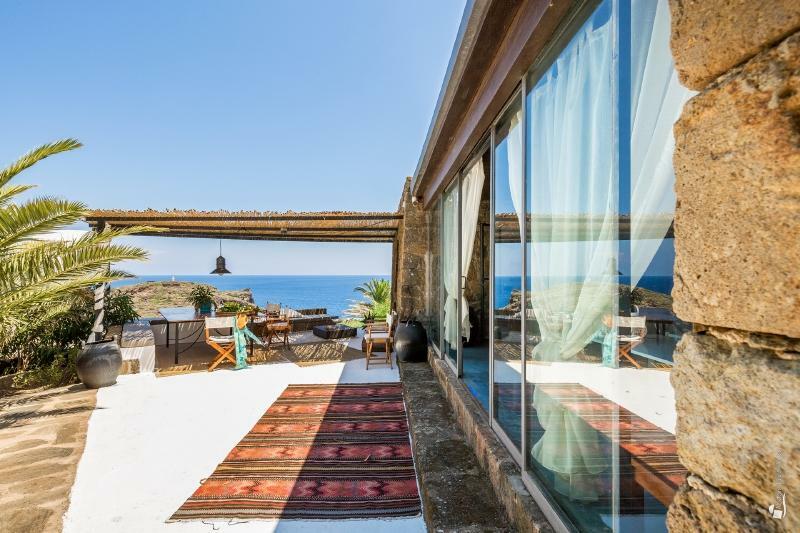 The dammuso invites you to discover the eastern side of Pantelleria, submerged into a nature that gives amazing spots and breathless views, admiring romantic sunrises and savour marine breeze taste-like days. 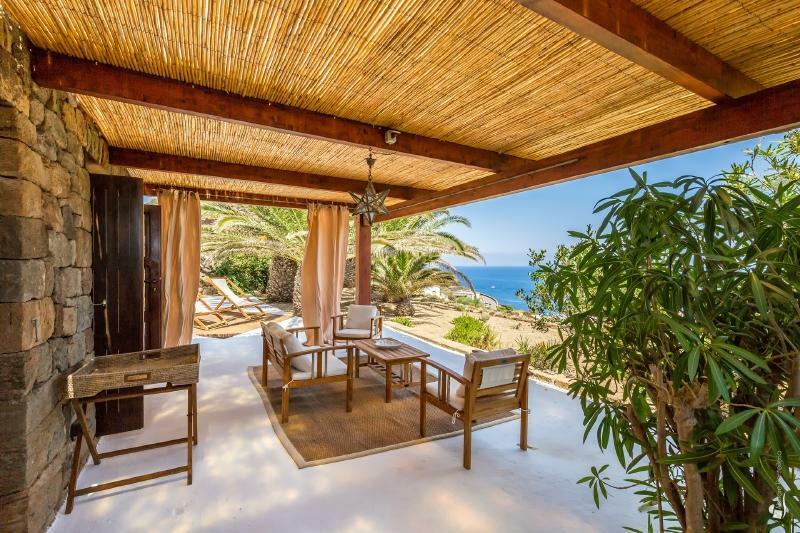 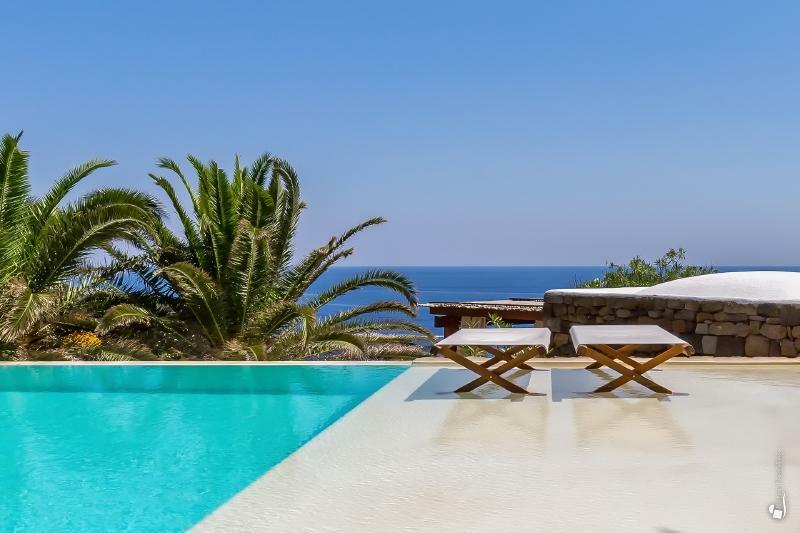 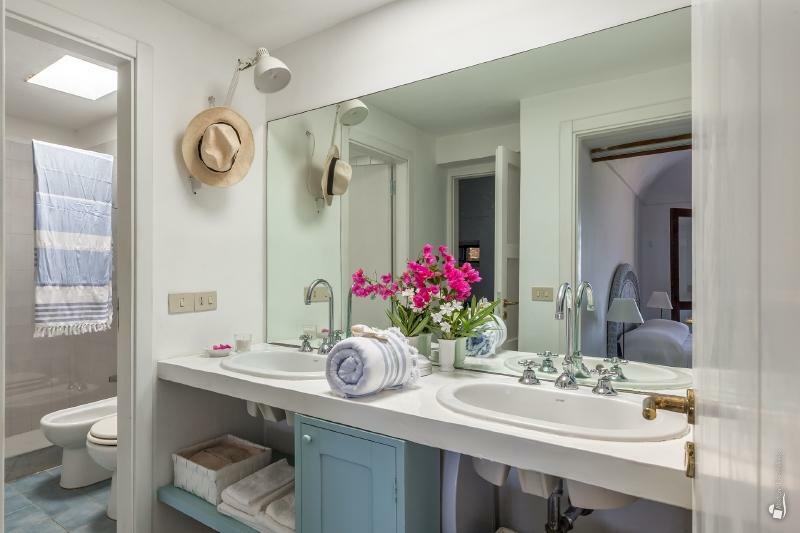 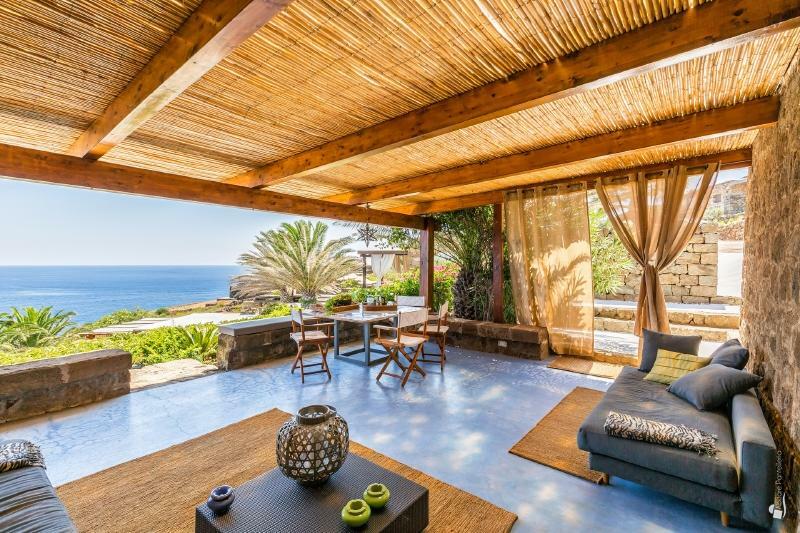 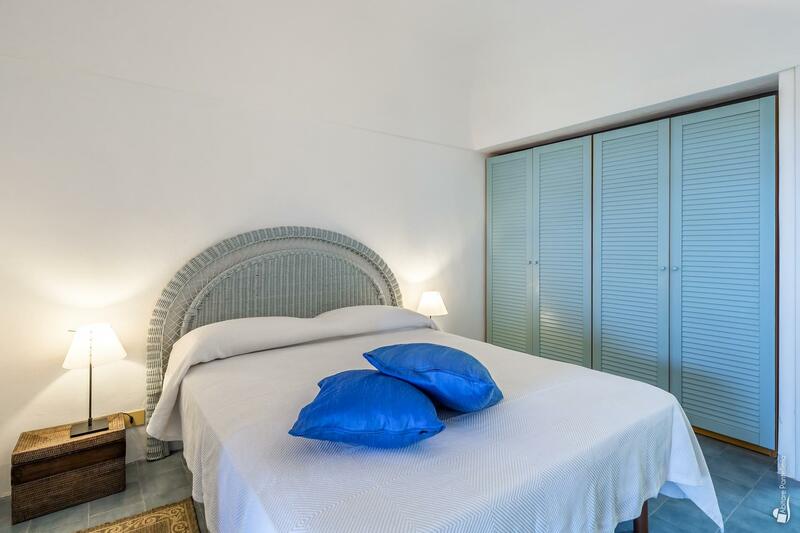 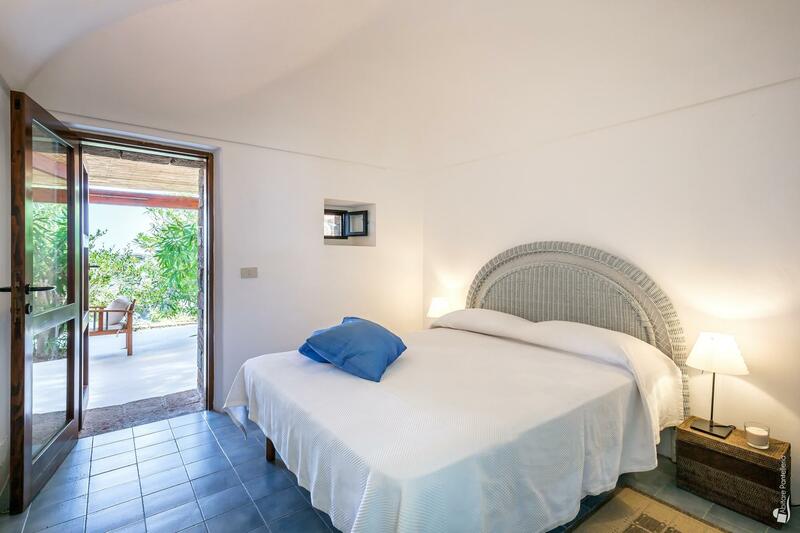 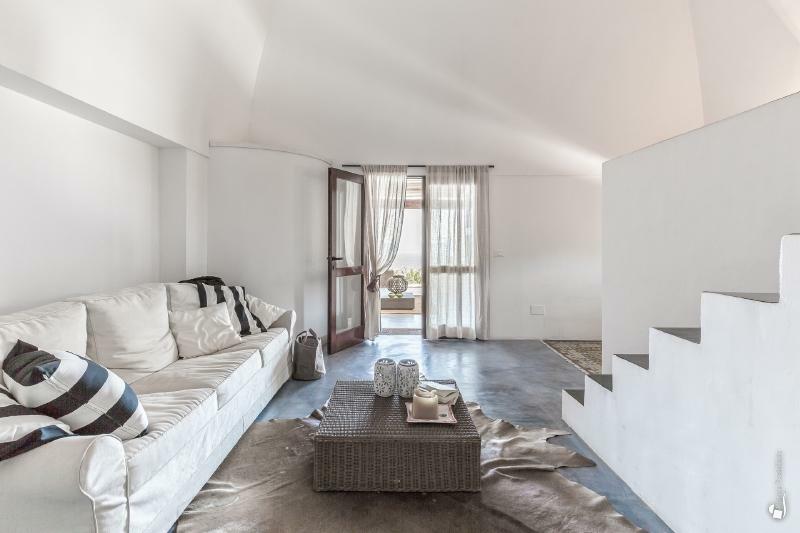 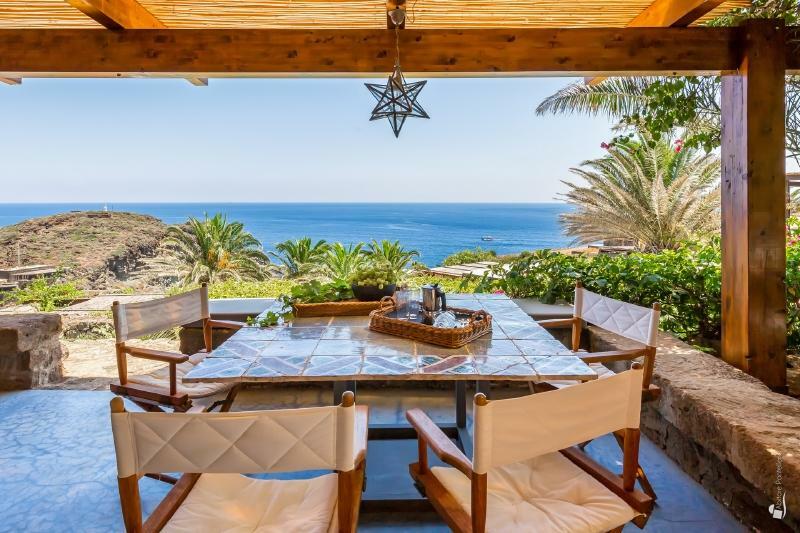 The structure can host up to 8 people in 4 different double bedrooms displaced into three different buildings; a magnificent sea view swimming pool and a luxuriant garden with the bright and definite colours of the bougainvillea are around them. 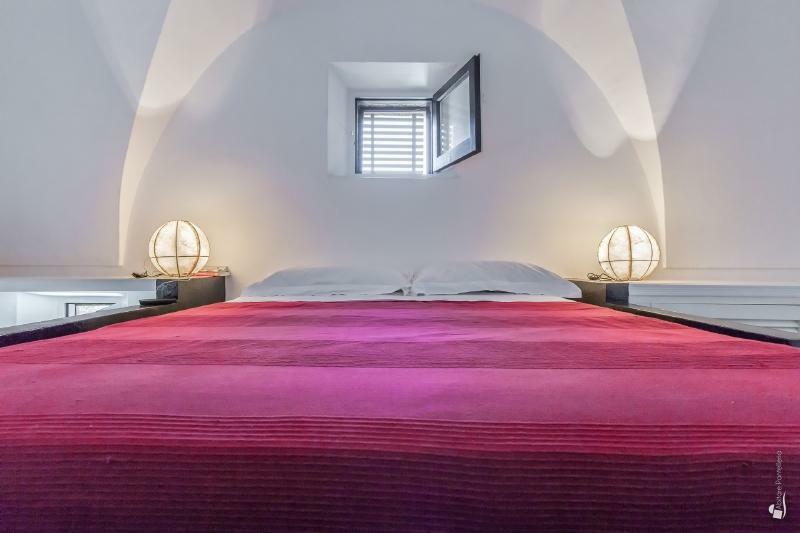 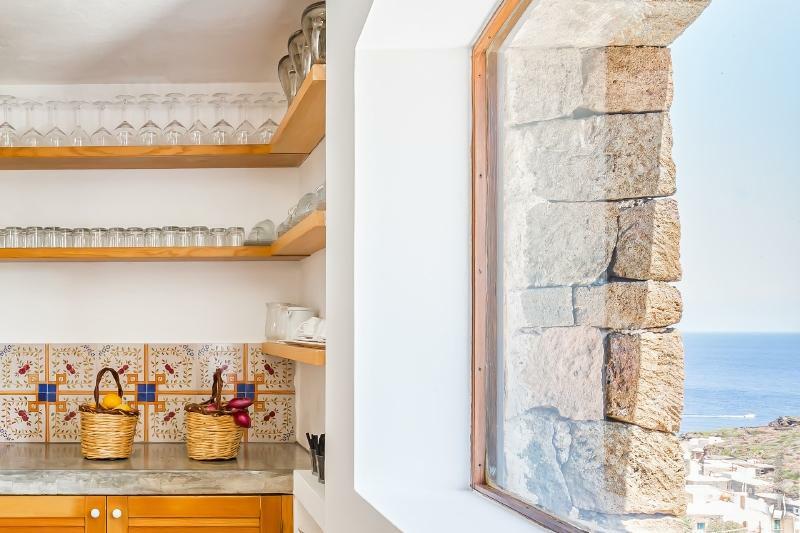 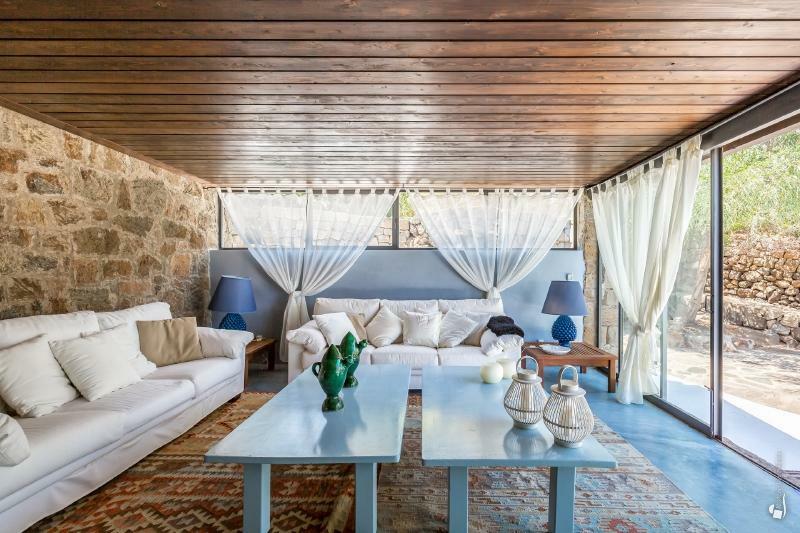 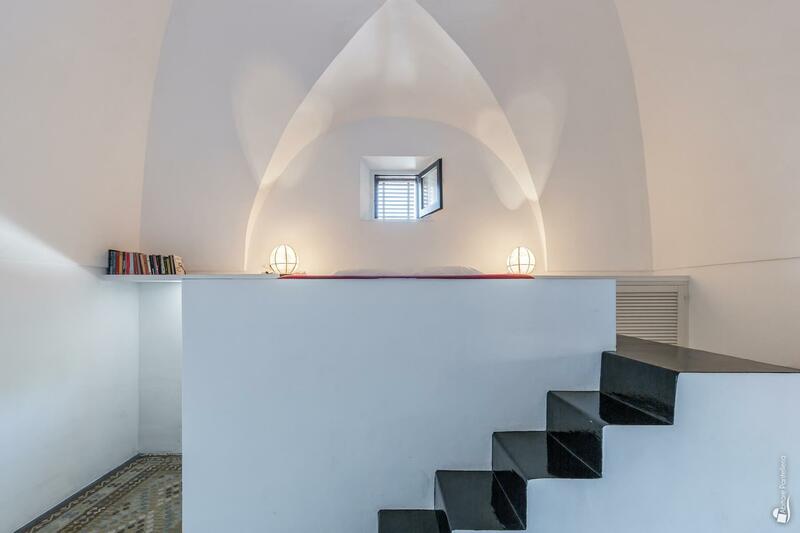 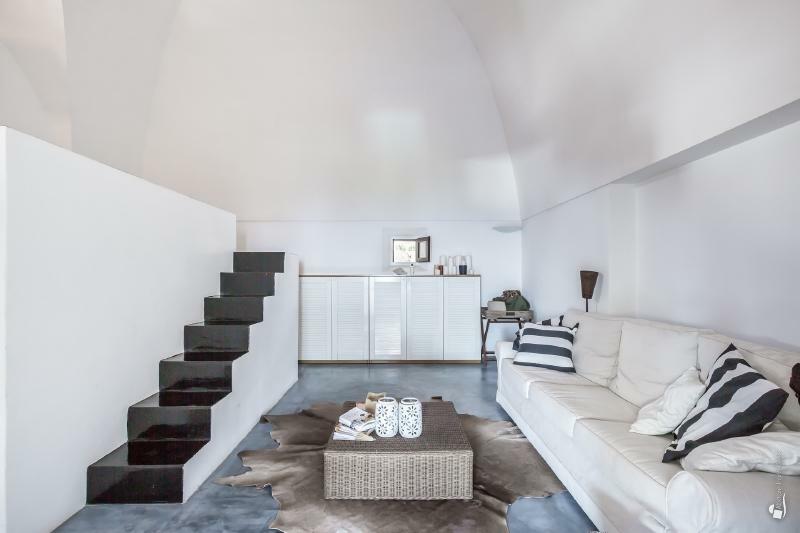 Each room is extremely painstaking in every detail, with Mediterranean atmospheres and minimal chic details, where the warm colours of the kilims fit perfectly with the white colour of the walls and the stone walls oppose to concrete floors. 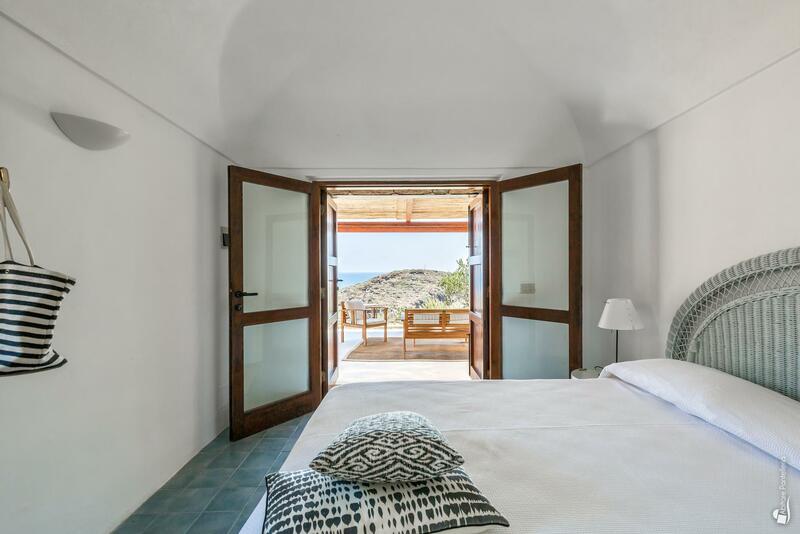 The result is a place that gives to its guests the pleasure to live a holiday signed by refined simplicity. The main dammuso has a living room, a kitchen from where to access an external dining area, covered and sheltered from sirocco winds, a double bedroom with ensuite bathroom and with a particular design, it has a staircase the leads to an intermediate floor that hosts the master bed; on the outside there’s a beautiful terrace, the perfect place to eat while having a breath-taking view of the sea. 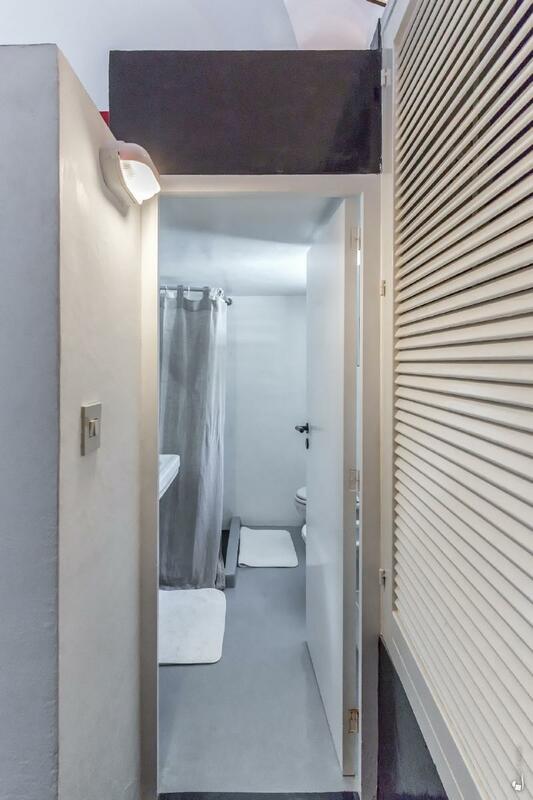 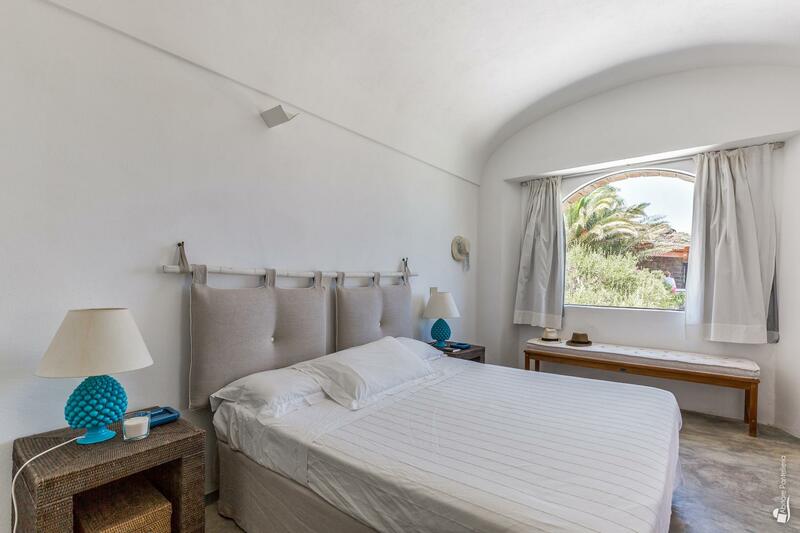 Just below there’s an annex with a double bedroom, bathroom and an exclusive use terrace; past the swimming pool there’s the third building, with two double bedrooms, bathroom and an external living room. 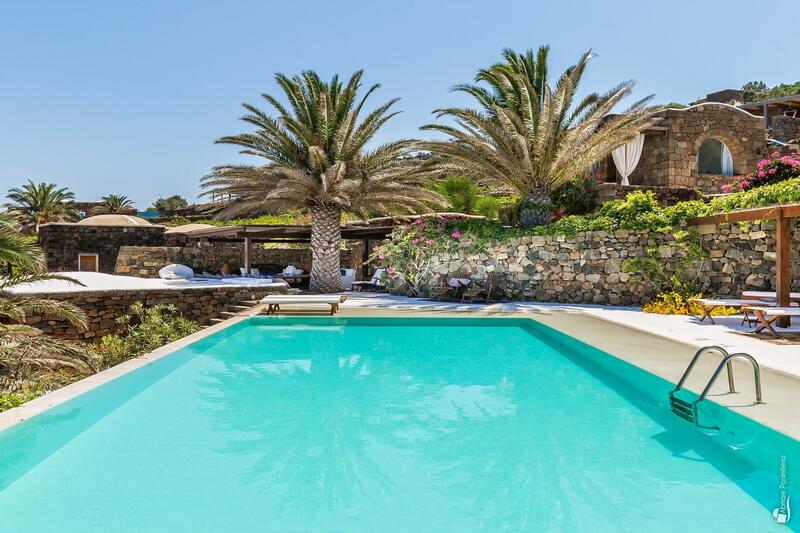 You can’t miss a splash into the magnificent sea view swimming pool, with a solarium area and a shaded area, decorated with taste and where to relax over comfortable cushions and chaise longues. 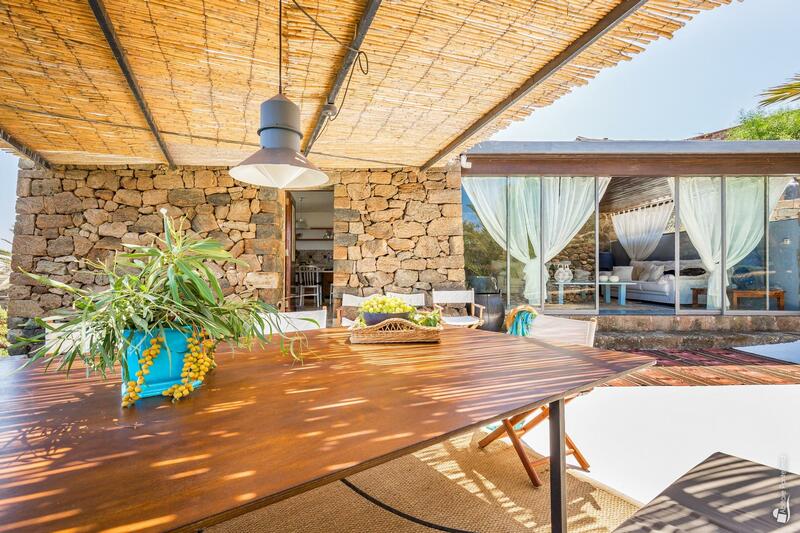 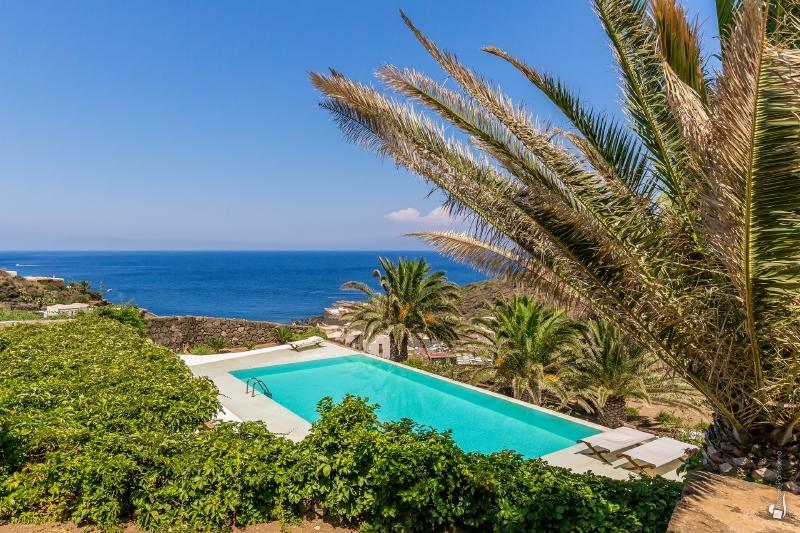 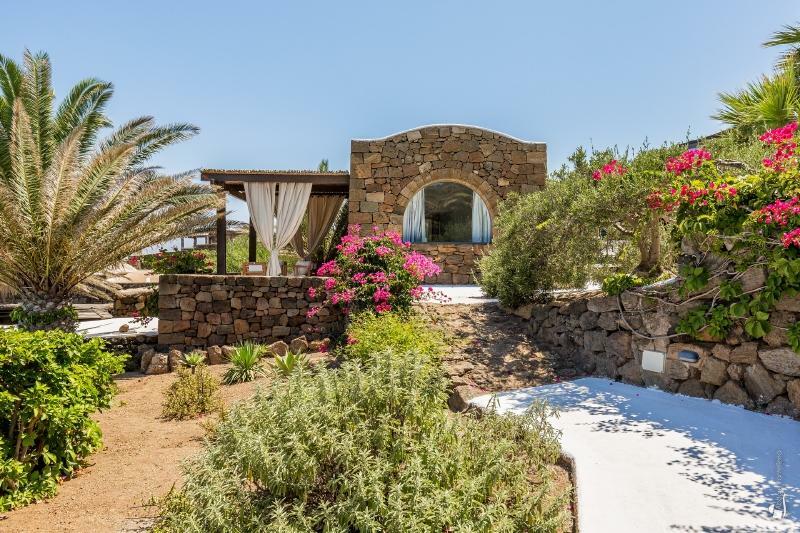 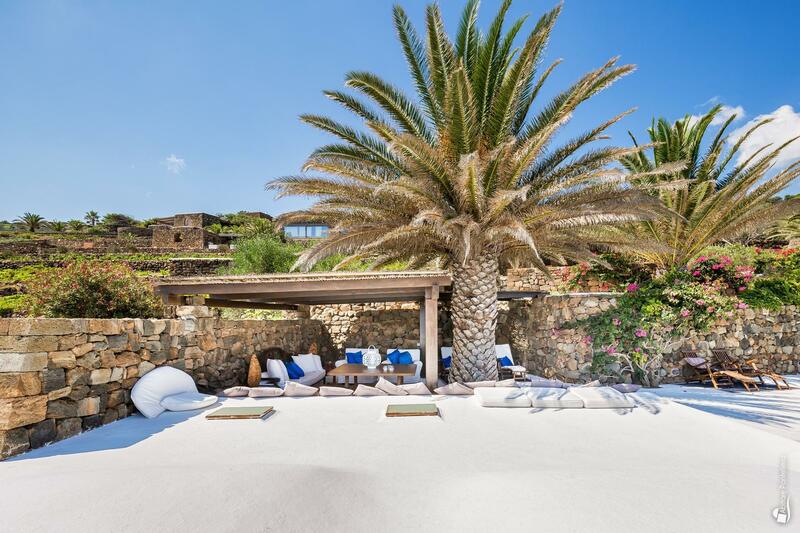 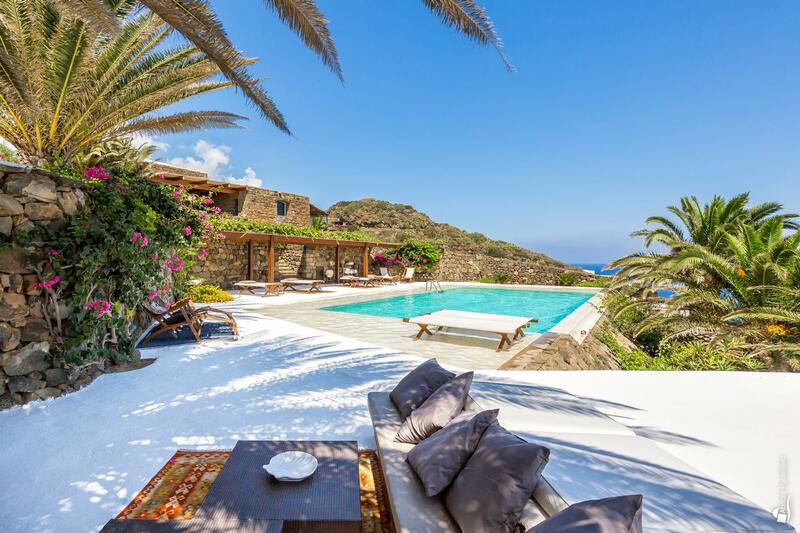 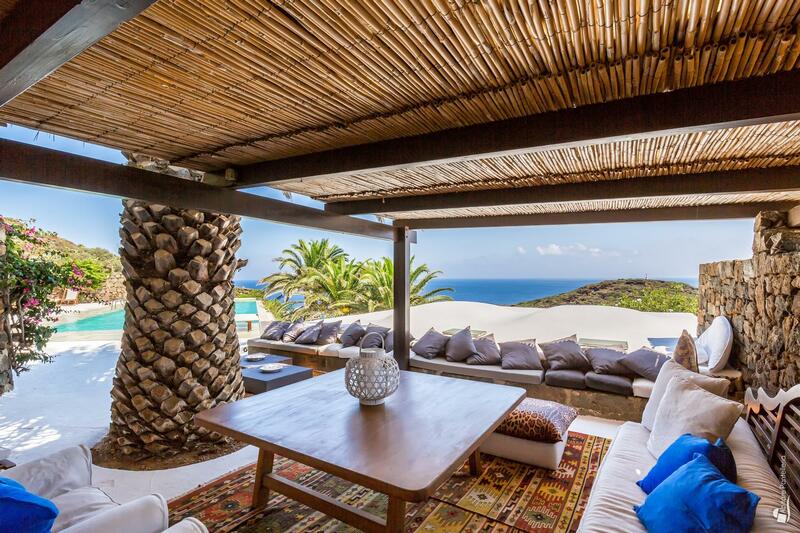 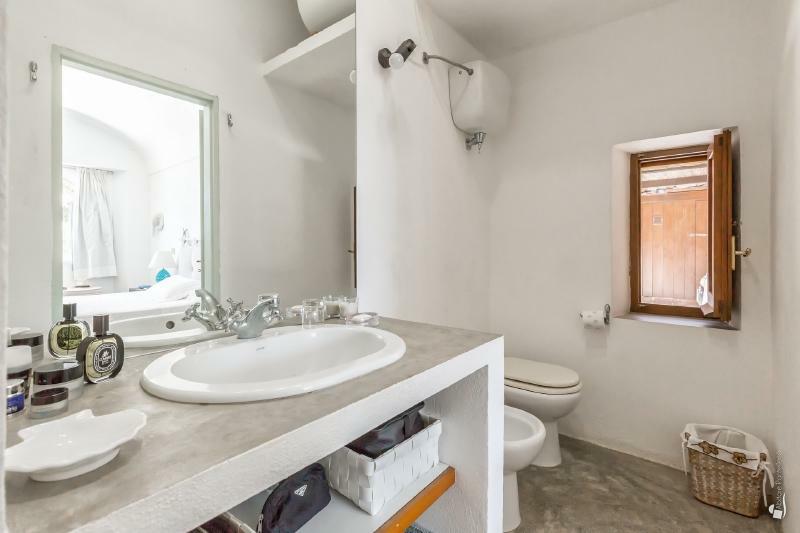 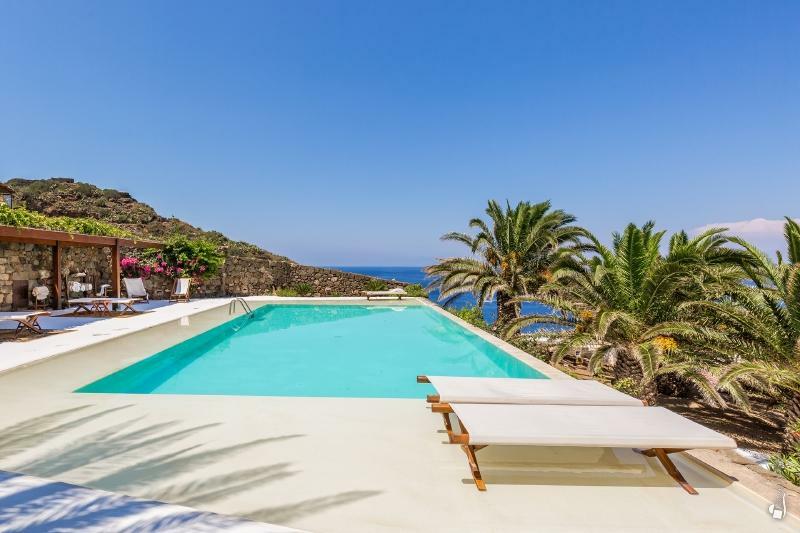 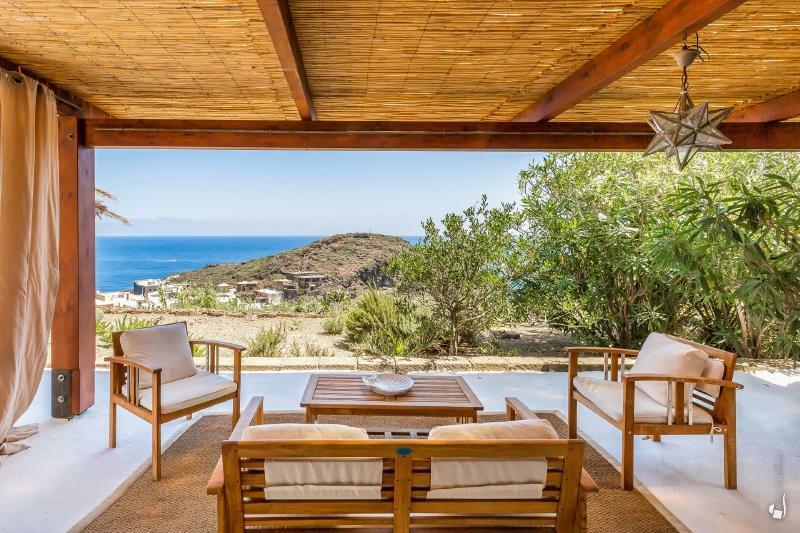 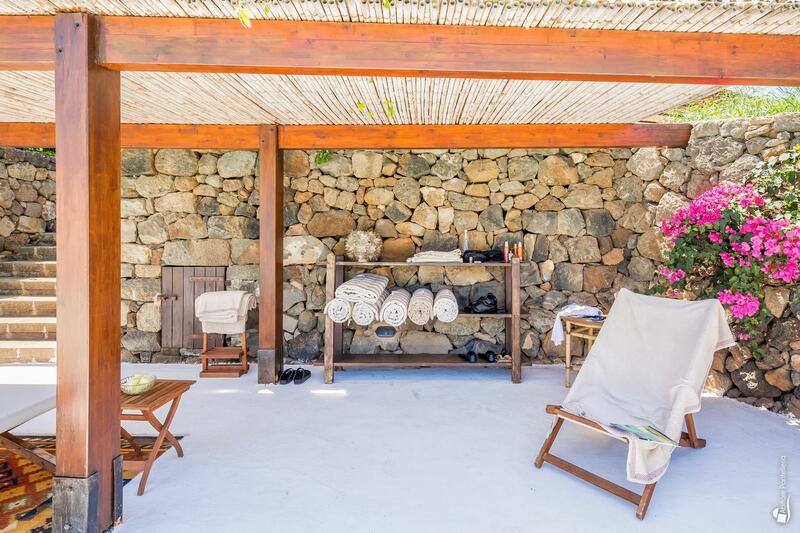 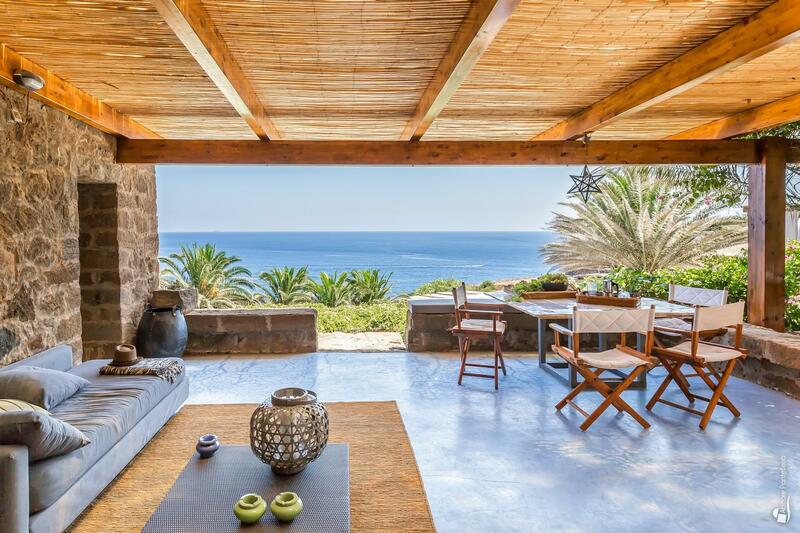 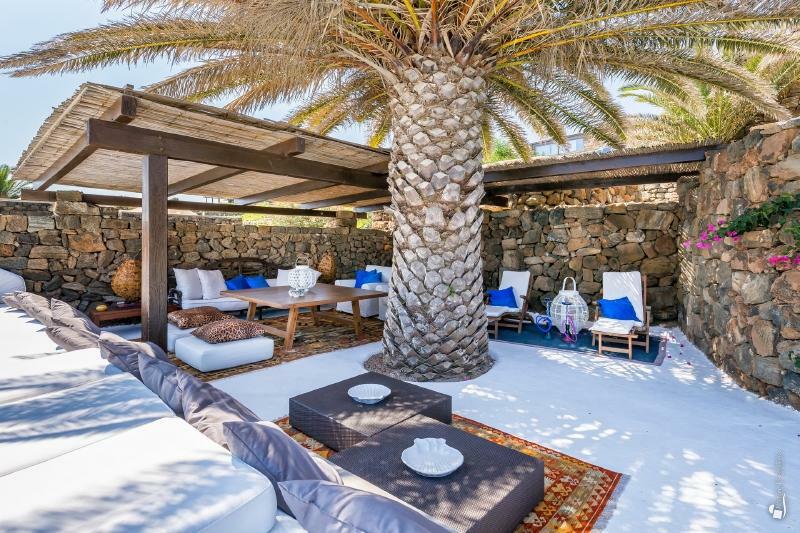 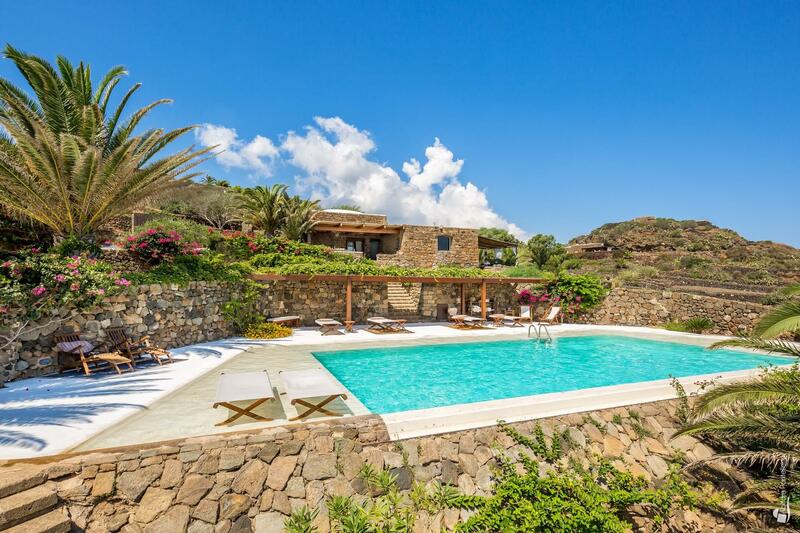 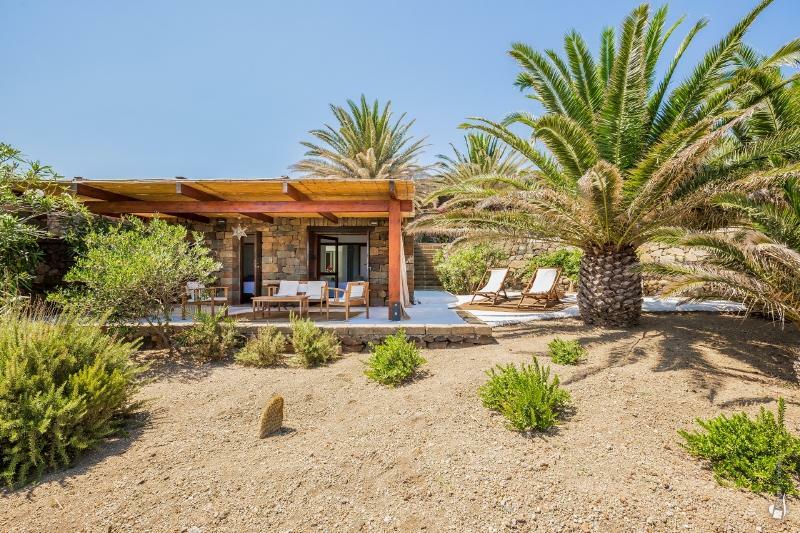 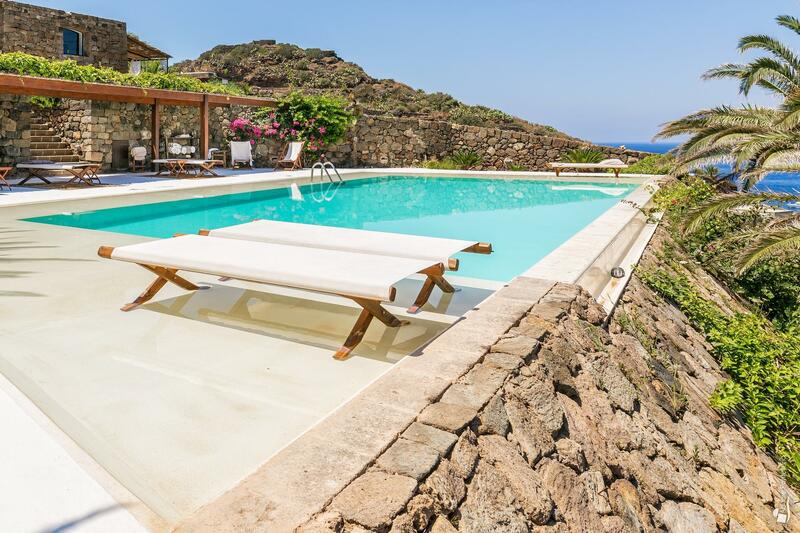 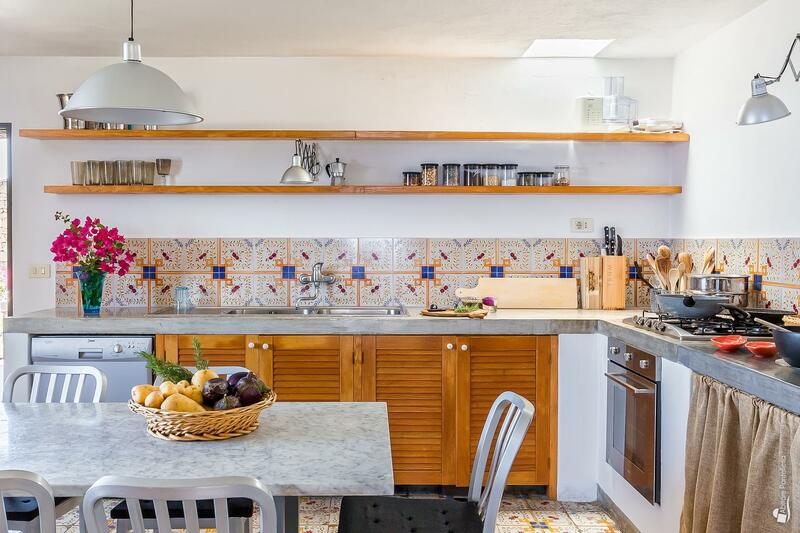 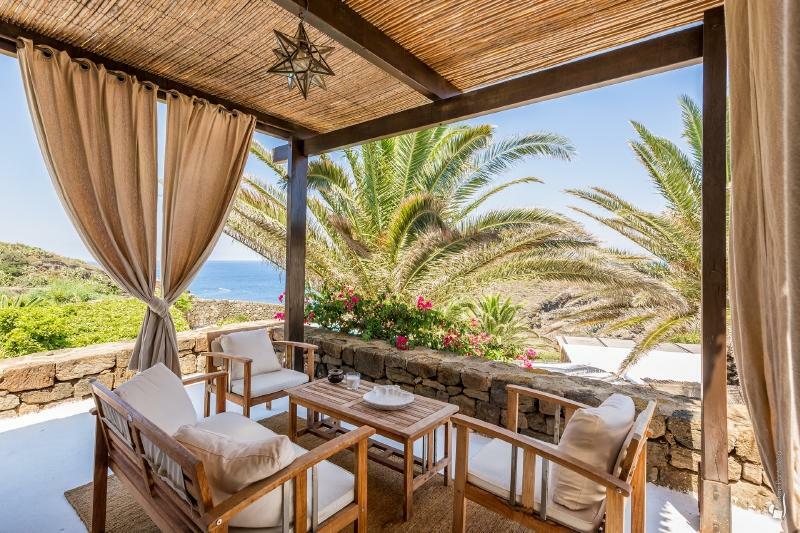 Among the services offered, you will have daily cleaning and the possibility to rent through Abitare Pantelleria a car or a scooter to move around the island freely. Apart from the locations mentioned above, the dammuso is located in the perfect spot in order to reach the natural and hot pools of Cala Gadir, the scarpetta di Cenerentola, where the waters turn magically blue or up north to the Lake of Venus. 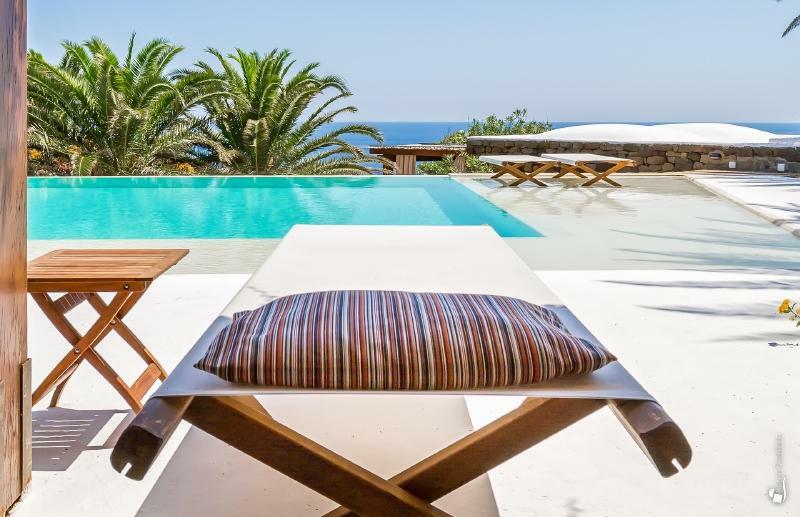 Furthermore, at a short distance you can shop or have dinner in Khamma and Tracino.